Don't spend your time squinting and straining your eyes, trying to read miniscule text in bad lighting. The LED Lighted Flex Magnifier makes reading the smallest text, in even the worst lighting, a breeze. 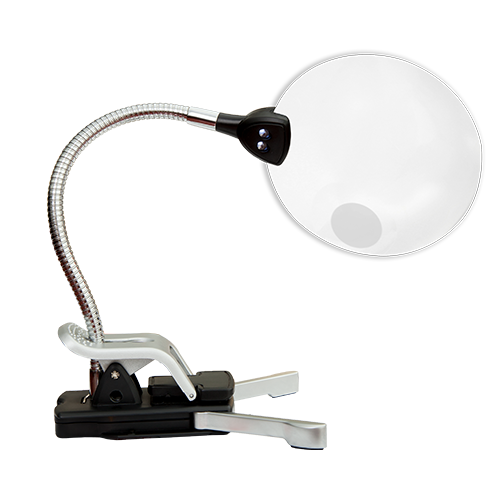 The LED Lighted Flex Magnifier(MAG02) is a compact, LED lighted desktop magnifier with a 2.5X Magnification Lens with 5X Inset Spot Lens. With two (2) super bright, LED lights, the MAG02 enables you to read small text, or see fine details regardless of the lighting. With a clamp-on or free standing option, this magnifier is perfect for any flat surface.